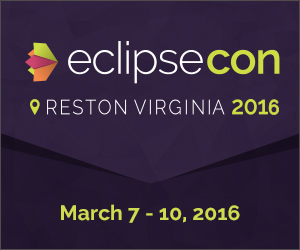 We are please to announce the 2016 program for EclipseCon North America. See the list of accepted sessions online now, including tutorials, talks, and Theme Day sessions. With the move to Reston, we have more this year: more sessions, more Eclipse-focused content, and more topics for working groups and other special communities. Please consider being a sponsor; we have a variety of packages and creative ways to show your support and connect with attendees. And don't wait to register; the lowest price lasts though January 7, 2016. It's almost time to nominate candidates for the Eclipse Foundation Board of Directors. Each year the voting members of the Foundation elect Committer Representatives and Sustaining Member Representatives. Watch for an announcement soon about election dates and details, and a post on the Member-Committer mailing list. 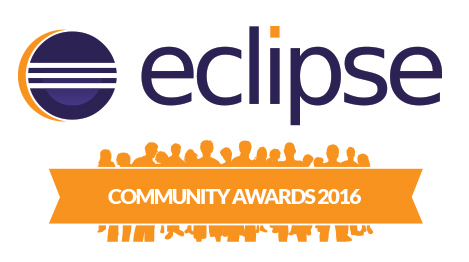 The Eclipse Community Awards recognize the best of the Eclipse community: Top Committer, Top Newcomer Evangelist, Most Innovative Project, and Most Open Project. Anyone can nominate, and we encourage you to suggest your favorites. Self-nominations are welcome. The term "frameworks and tools" is now "frameworks and applications" to acknowledge that projects are creating deliverables that expand the traditional focus on tools. "Freedom of Action" has been added as a principle of the EDP. This formalizes the requirement that teams ensure the continued viability of the project by using only those resources approved by the Eclipse Foundation for critical project operations. New projects now require only one mentor from the Architecture Council. A new mailing list, incubation@eclipse.org, provides a way for incubating projects to participate more directly with each other and with the Architecture Council. This list is open to everyone interested in the process, and we hope the community will use it to share hard-earned wisdom and help make our projects stronger. Note that at the bottom of the document there is a list of issues addressed in the revision, and a link to a "diff" document that details the updates. TEAMEngine (Test, Evaluation and Measurement Engine) is a Java-based test harness for testing web services and other resources. OpenCert is a product and process assurance/certification management tool to support the compliance assessment and certification of safety-critical systems in sectors such as aerospace, railway and automotive.